Marinella lives with her family in a village by the sea, at a time when Vikings are at the height of their rule. They travel the seas and cause terror and destruction wherever their ships land. Nella’s village is attacted but the Fortress Rock keeps most of them safe. As the Vikings finally leave, Nella and her friend Pekko find a wounded Viking boy and rescue him. The boy, Egil, belongs to the enemy, but could he also be a friend? Viking Knot unfolds a fascinating adventure set in a historical period. This is a story about the wisdom of children, and a friendship that conquers prejudice. 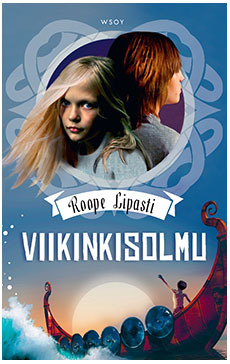 The Viking Knot is the first book in Roope Lipasti’s exciting trilogy: a convincing tale of friendship between three children in the era of the Vikings, those brutal Nordic Kings who ruled the seas and their shores. The children’s lives are thrilling, dangerous even, but resourcefulness, courage and friendship help them at their time of need. The Viking Knot won Roope Lipasti both the LukuVarkaus and the Kirjava Kettu Awards.